Every week you’ll receive a dozen emails from companies you know nothing about, telling you about some feature you don’t understand, that was added to a product you don’t use. People lament how email marketing has become less effective these days, but when you review some of these mails sent, it’s not surprising. Here’s the type of product announcements mails I’ve regularly received from companies where I have literally no clue who they are or what they do. Real identities masked, of course. 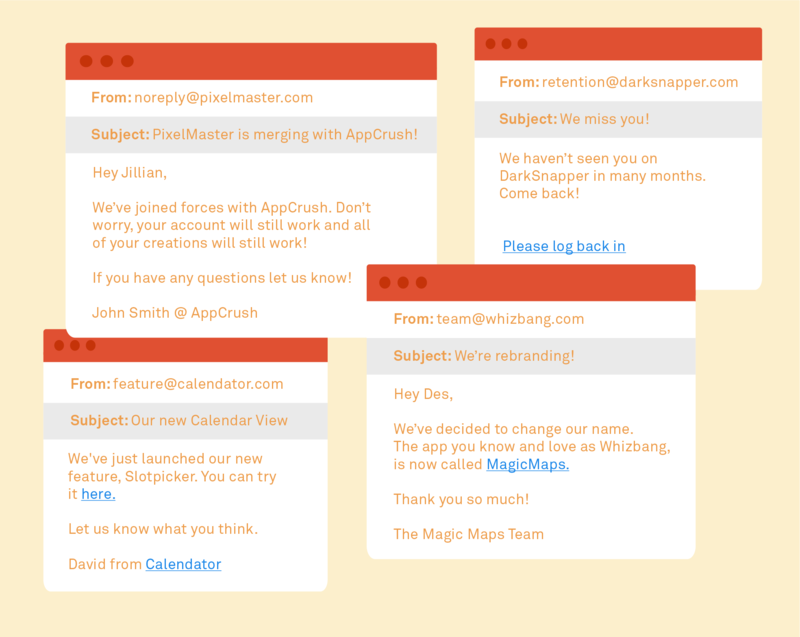 At Intercom, we encourage customers to send well-targeted messages. The right message to the right customer at the right time in the right medium. Treating your userbase as one homogeneous blob is the exact opposite of that. For each of your announcements you should have a minimum of two groups: active and inactive. You can go much deeper with the categorizations here, but this is a good starting point. 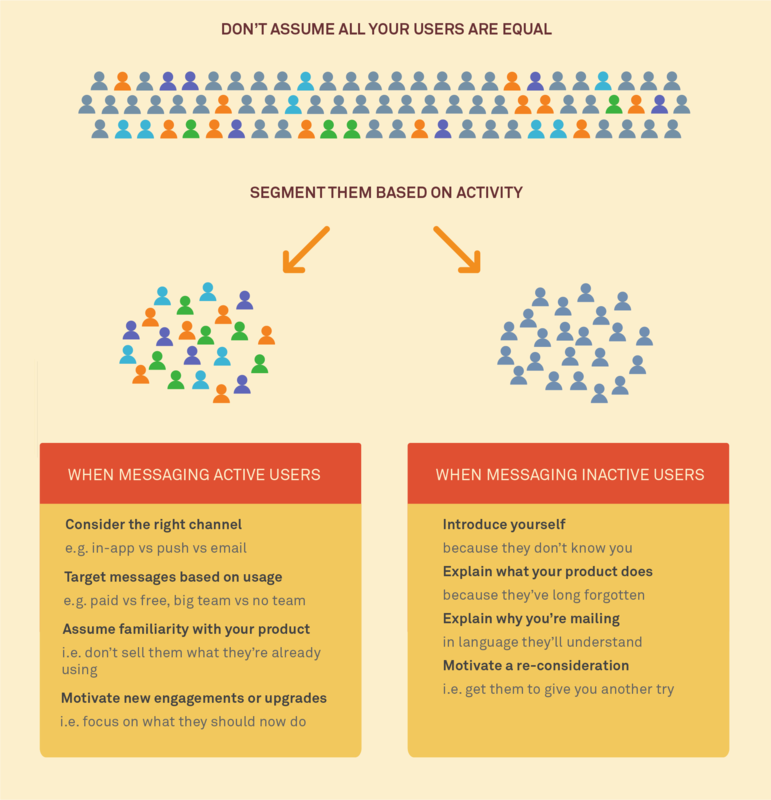 Active users should be treated like your regular customers. They’re in your product quite often, so you should treat them accordingly. Don’t try to sell them a product they’ve already bought, don’t try promote features they’ve already used and don’t pitch them things they can’t use. Instead, focus on things you think they should try. As a simple rule, if you wouldn’t do it in person, don’t do it here. Inactive users should be handled delicately as well. They might remember your name, they might have some vague idea what your product does, but it’s likely out-of-date and you’ve (hopefully) improved your product a lot since then. What you need to focus on is what your product does, what news you have and why they should check up on you again. False assumptions or false familiarity here will only lead you straight to the archive folder. You can take this further. Your inactive users aren’t all the same either. Some have never been active while others were active for just a few days. Some added their team, some never did. Much like it’s bad to base your behaviour on an average conversion rate, it’s bad to write messages for the mythical “average user”. Remember that the “average” person has 1.96 legs and 9.7 fingers, and I bet you don’t know many people like that. 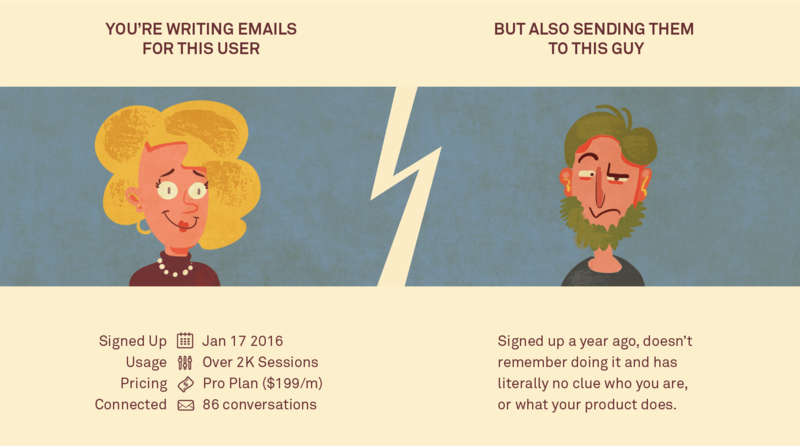 Write for people, not for averages, and your messages will perform much better.